Earthen ware vessel from crannog excavations. 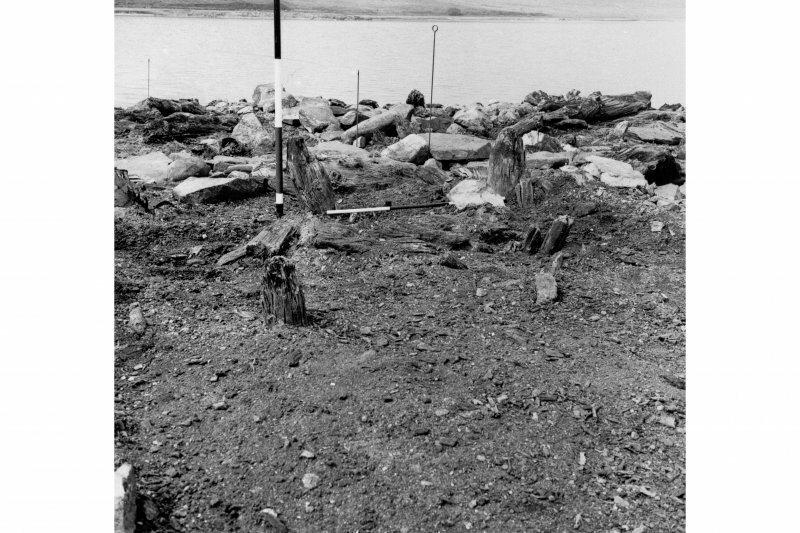 View of the excavation at Loch Glashan crannog. View of find from the excavation at Loch Glashan crannog. 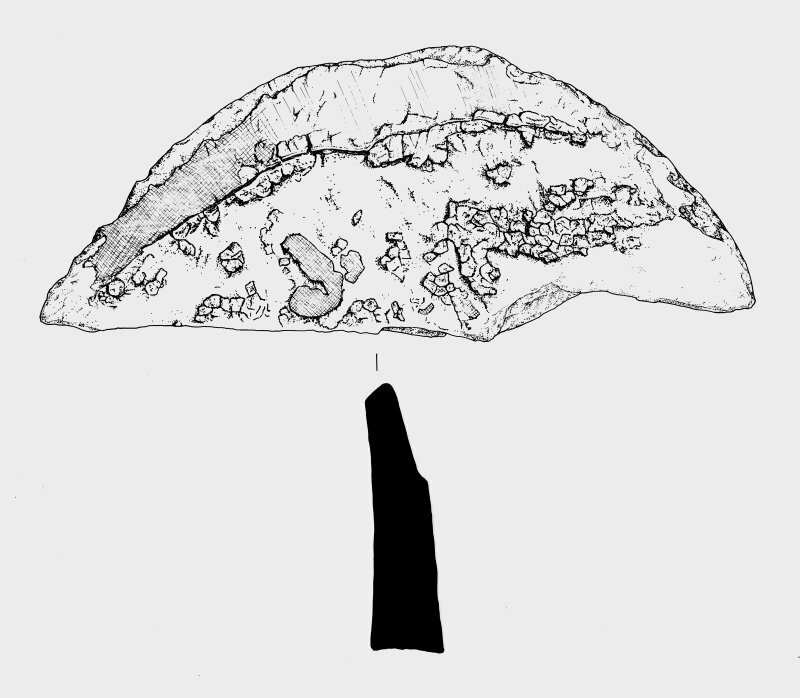 Drawing of axehead, SF 174. 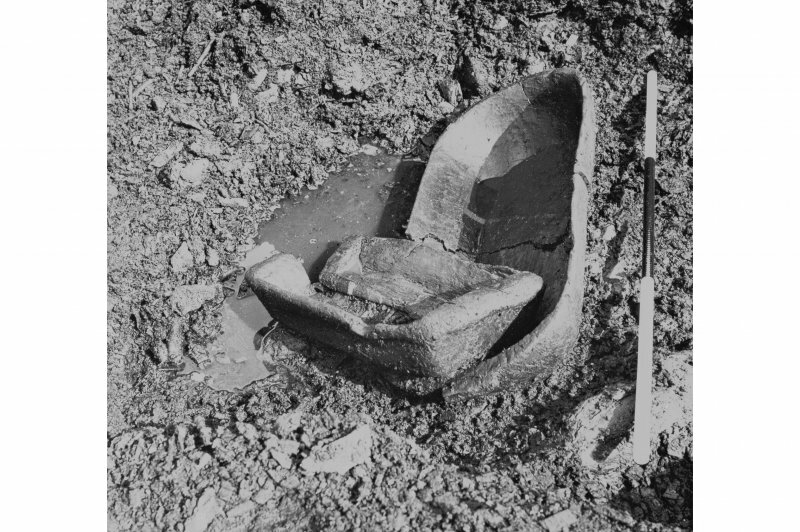 Scanned image of excavation finds, wood and pottery. Publication Drawing; crannog, Loch Glashan. Photographic Copy. 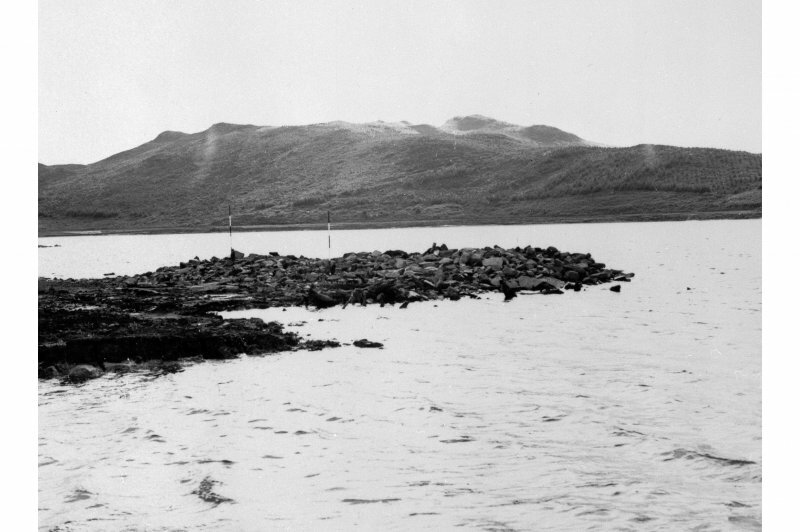 View of Loch Glashan crannog. Drawing of brooch, SF 80. 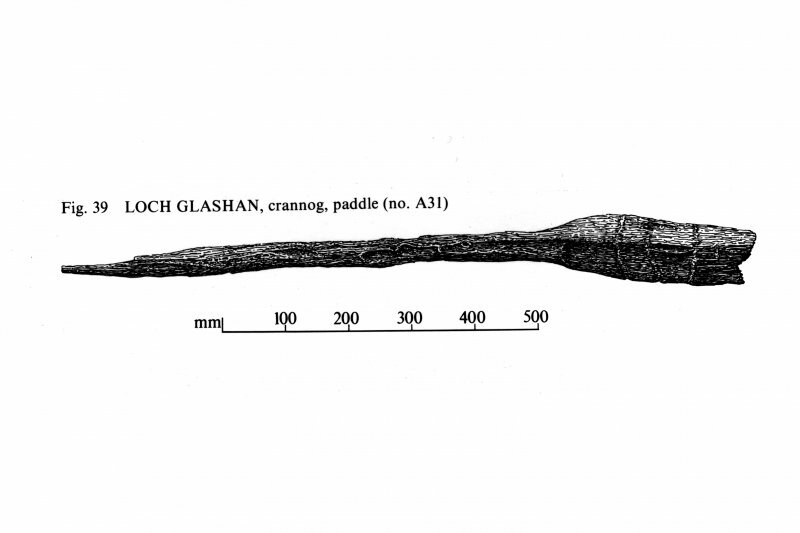 Loch Glashan, crannog, possible model paddle. Drawing of baking plate, SF 33. Publication drawing: Loch Glashan Crannog (after Jack Scott). Photographic copy. 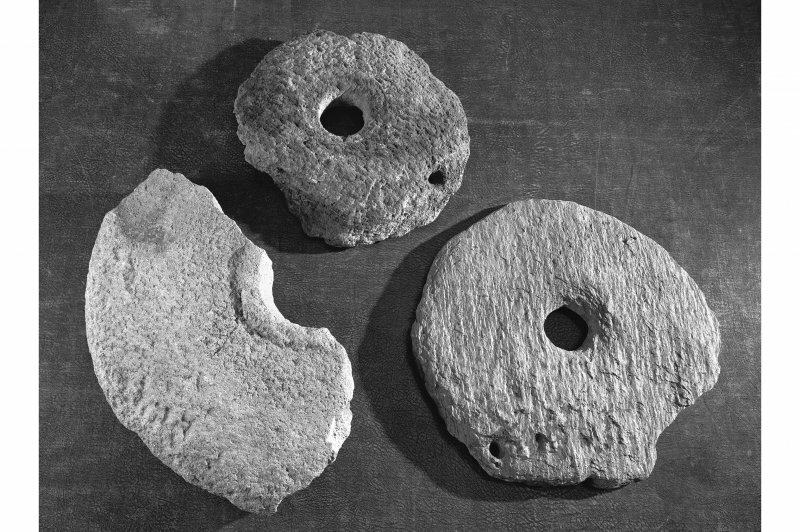 Rotary querns from crannog excavations. For paddle found near the crannog, see NR99SW 23. 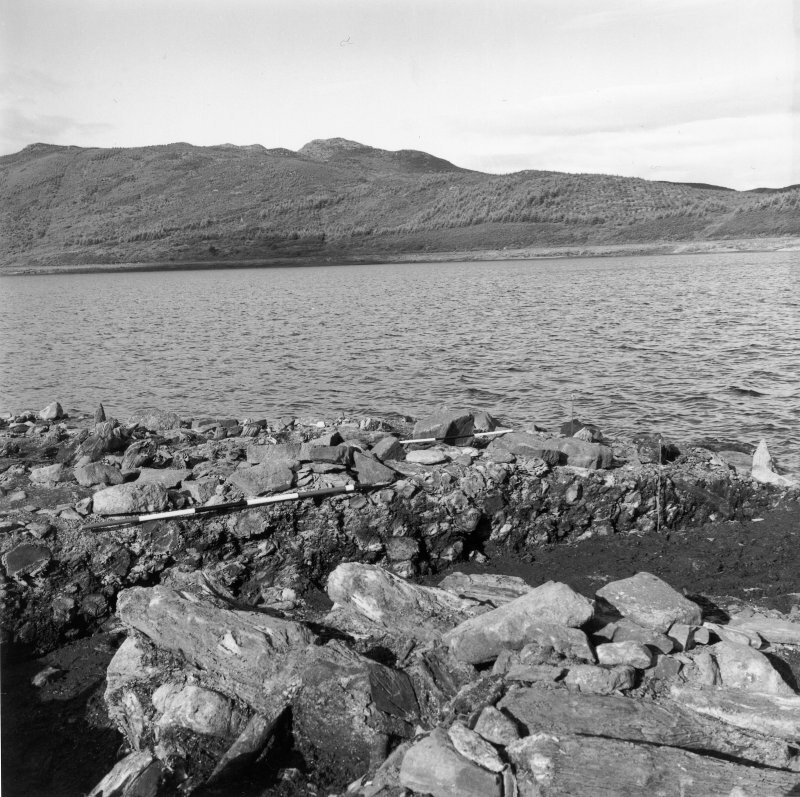 (NR 9160 9247) A crannog was exposed by the lowering of the waters of Loch Glashan during work on a hydro-electric scheme in April 1960. 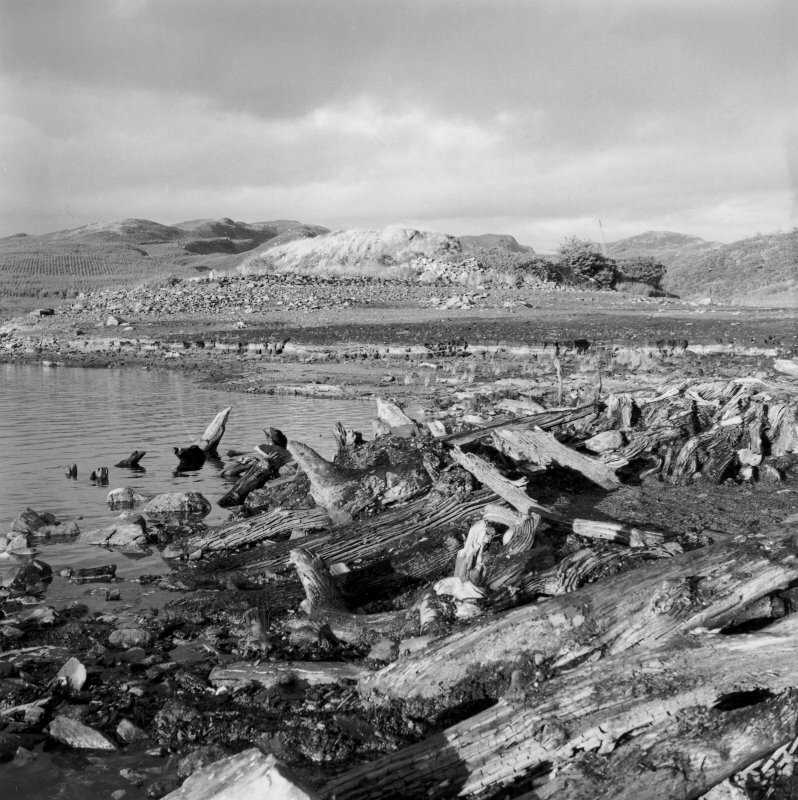 Excavation by Mr and Mrs J G Scott in July and August 1960 prior to the re-flooding of the site in the autumn of 1961 revealed the structure both of the oak and birch piles crannog itself and of the successive buildings it had borne. 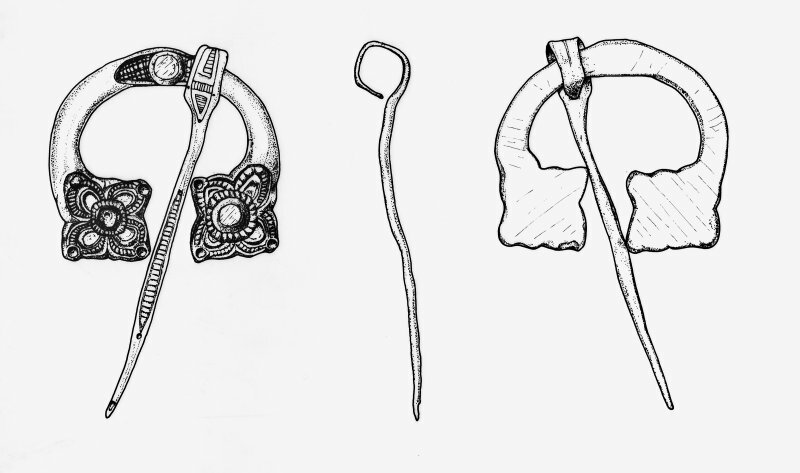 The many finds indicated an occupation between about 500 AD (as evidenced by sherds of Rhineland pottery) and 850 AD (evidenced by a bronze pennanular brooch). (See also NR99SW 2). This site is now completely submerged. Site positioned on 6" record sheet from Fairhurst's plan. Loch Glashan fills an upland basin about 2km NNW of Loch Gair, its waters formerly flowing freely down to the Abhainn Mhor to Loch Gair. 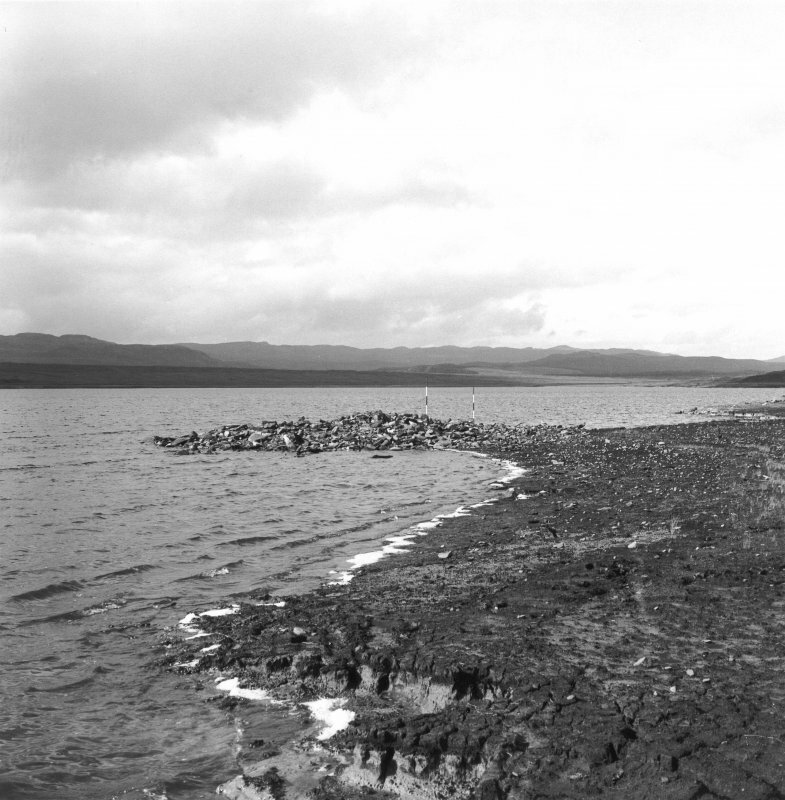 In April 1960, when the water-level was lowered by about 3m to allow the construction of a storage dam as part of a hydro-electric scheme, the upper part of a crannog was revealed; it was situated just off the S end of what had been a small island near the SE shore of the loch. 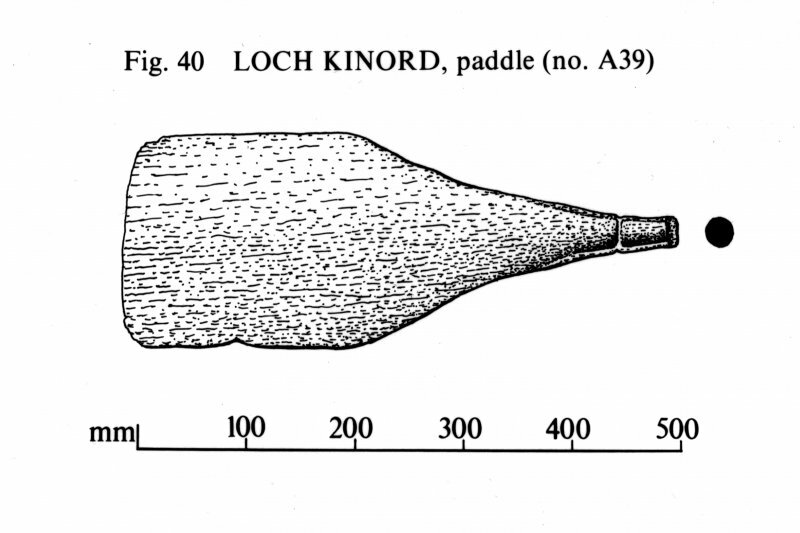 The crannog was excavated in the summer of the same year by Mr J G Scott (Scott and Scott 1960; Fairhurst and Scott 1961). 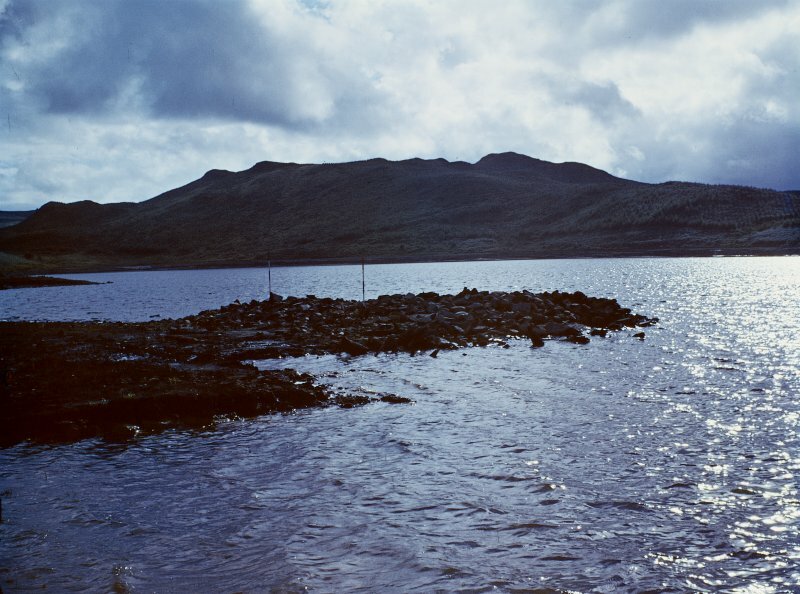 Situated about 45m to the WSW of the crannog, an island dwelling was excavated in 1961 and was found to be of medieval date (Glasgow Archaeol J 1969). 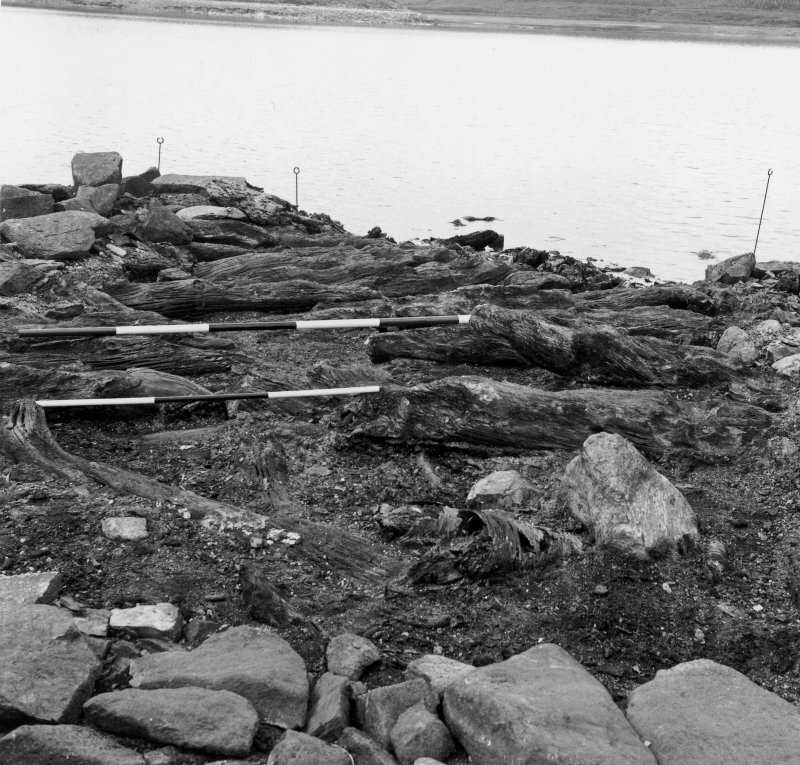 Other discoveries in the loch included two logboats, one of which (now preserved in the Glasgow Art Gallery and Museum) was found 950m NNE of the crannog, and the other near the island dwelling (Glasgow Archaeol J 1969). The crannog lay about 40m from the old shoreline at a point where a muddy shelf gave way to deeper water; the mud consisted of a soft yellow layer overlain by a brown layer about 0.15m thick, which was thought to be formed of decayed vegetation. There was no evidence of a causeway. 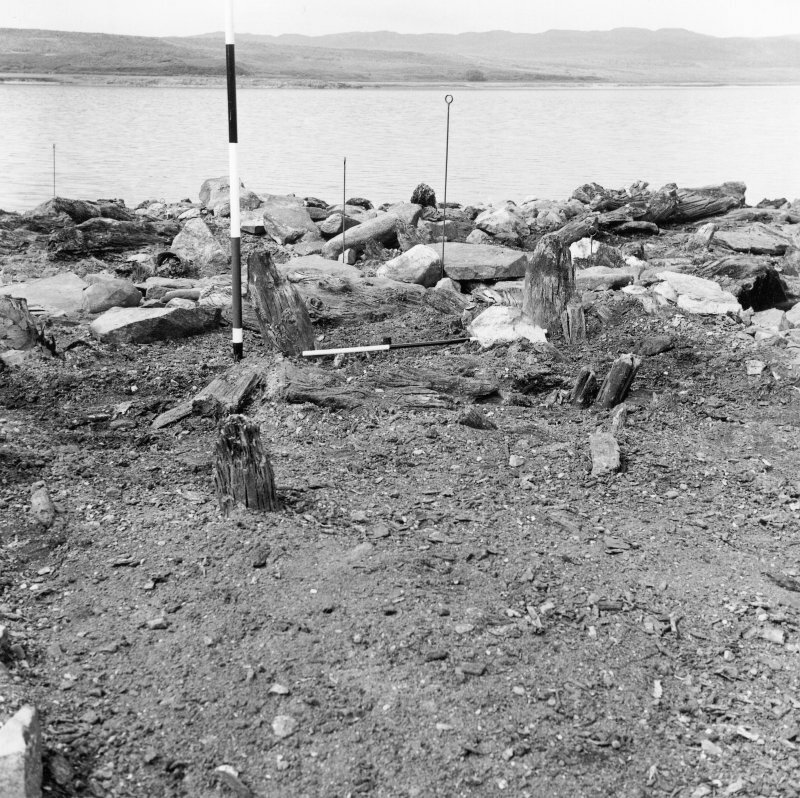 Prior to excavation the crannog appeared as a low mound about 0.9m in height, partly covered with stones and measuring about 16m by 11m, with a number of upright posts visible beyond the apparent edge; up to a third of its area may have subsided into deeper water, and it is thus difficult to estimate its original size. 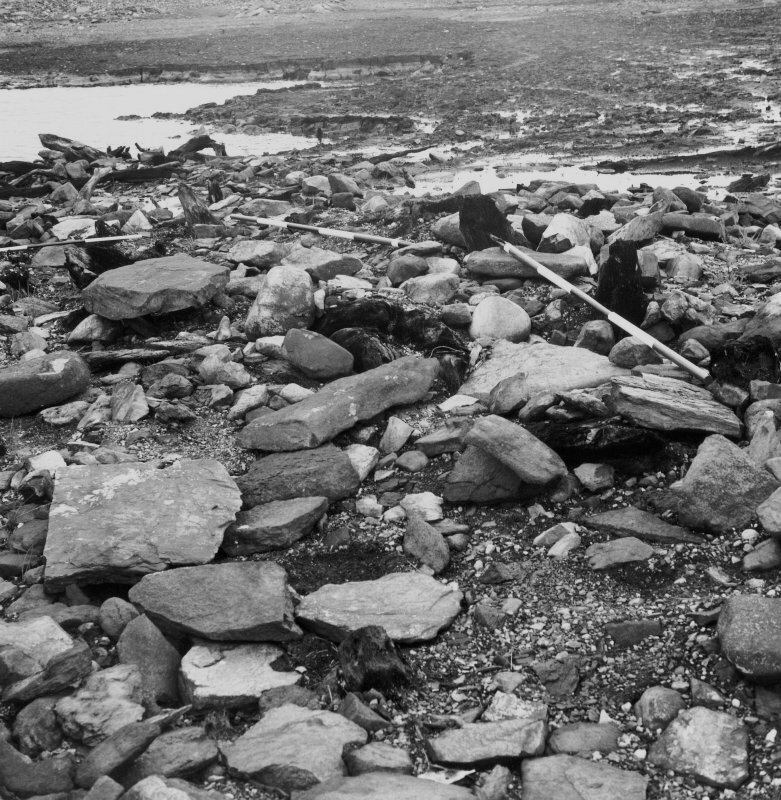 The site was divided into six sectors before excavation: the three landward sectors and the central section nearer to the edge of the water were taken down to a depth at which water penetration rendered further work impractical; the other two were not excavated. On the landward side the substructure of the crannog consisted mainly of brushwood mixed with ferns and bracken. On the other side layers of logs, mainly oak, but including some silver birch, had been placed on top of brushwood. It was thought probable that the whole structure had been stabilised by heavy piles, although no eveidence of these was found above the water-table. 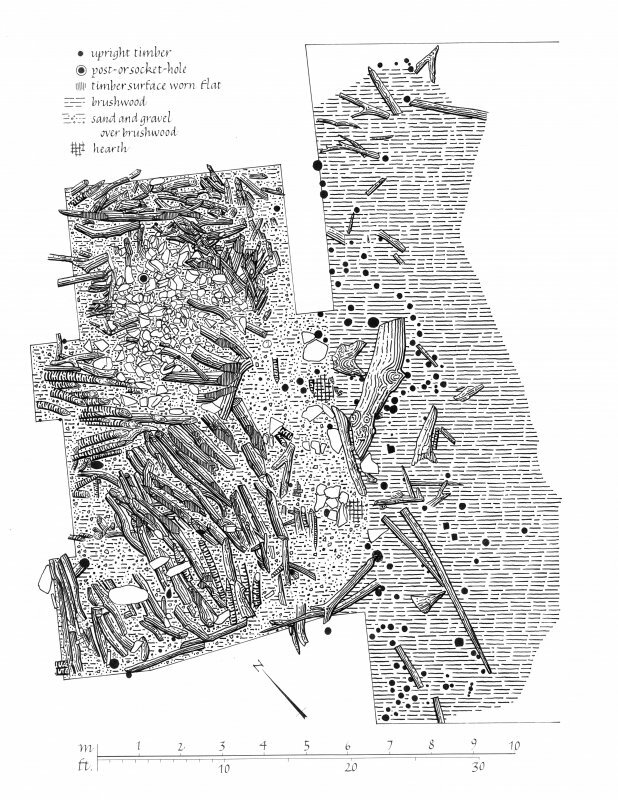 In the SW part of the crannog the sub-floor of a rectangular timber building was identified; the surviving portion of the sub-floor, which consisted of massive timbers stripped of their bark and roughly trimmed to form a level surface, indicates that the overall area of the building was about 7.5m by 4.5m. 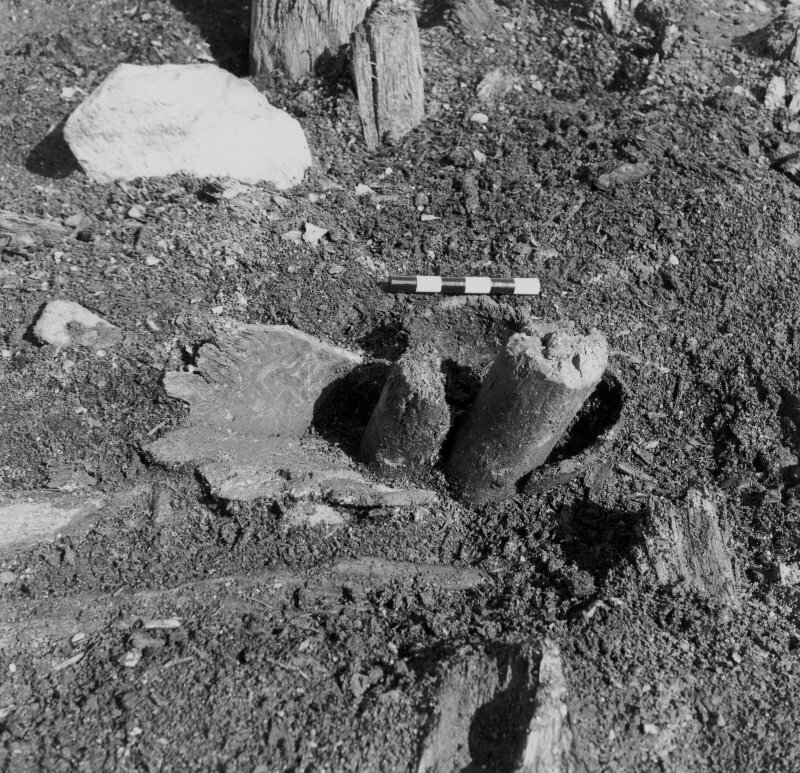 A forked timber, about 2m in length and lying on top of the floor, may have been the SE corner post; sockets cut into the timbers of the sub-floor may indicate the positions of uprights. The sub-floor was covered by a layer of sand and gravel, and the E end was roughly paved. The patches of clay adjacent to the paving were probably the remains of domestic hearths, but it is uncertain whether these were inside or outside the building. 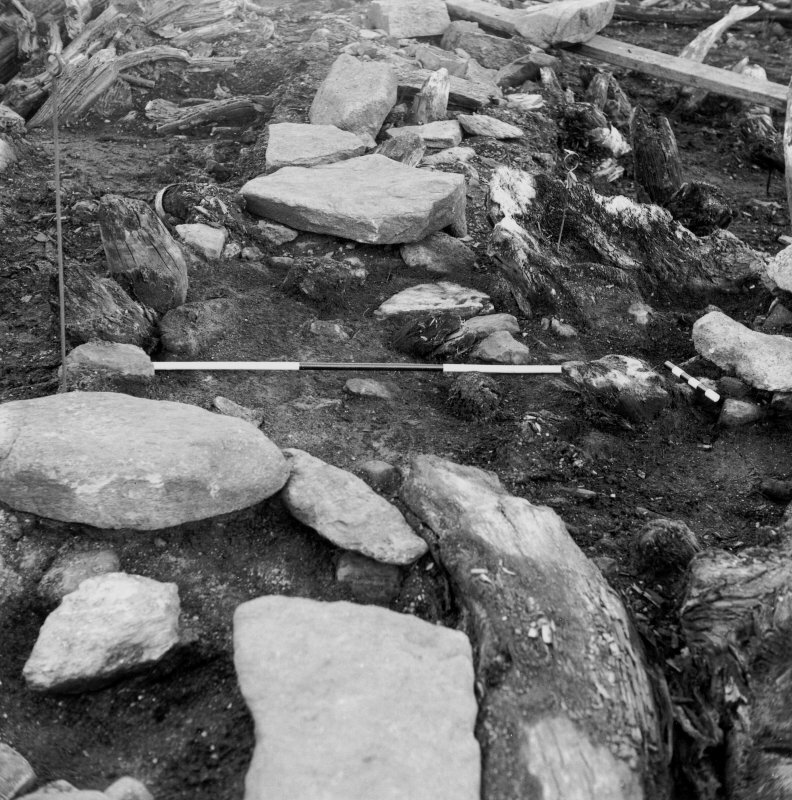 A pile of stones on the NW side of the crannog may have marked the site of another structure, but its form and its relationship to the house are unclear. 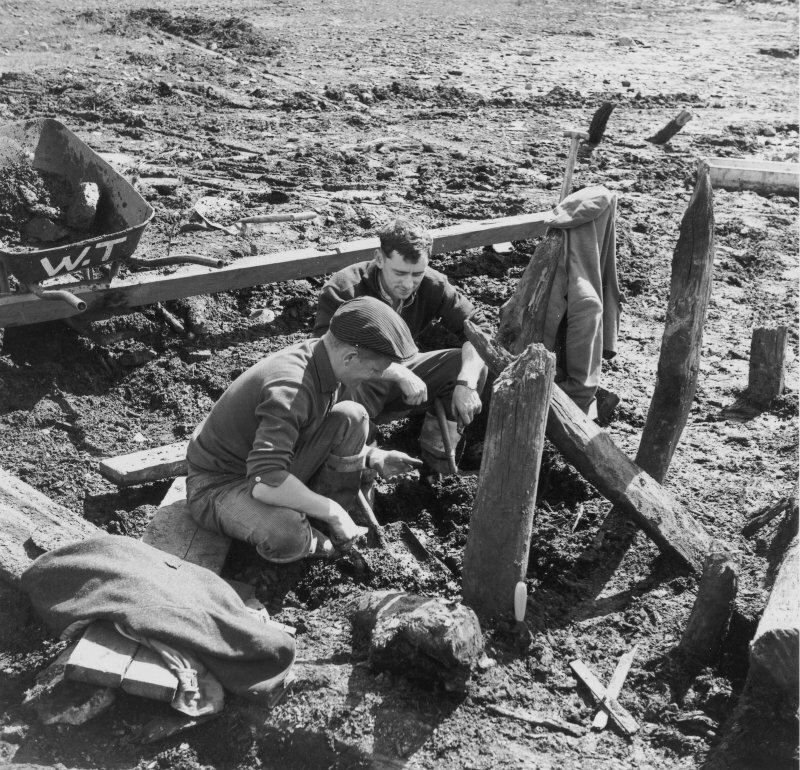 A considerable range of artefacts was recovered from the site, the majority of which, found in the layers of brushwood, had been preserved by the waterlogged conditions. 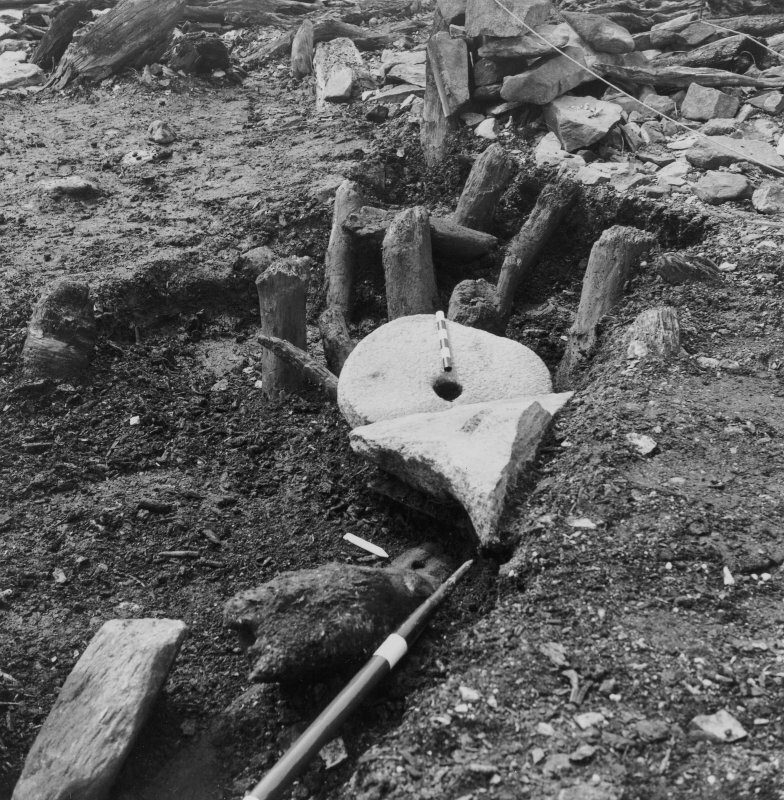 The large number of wooden objects is worthy of particular note; they include a paddle, a bucket (reused to line a post-hole), a scoop, several bowls, a trough, a spoon, and a spindle-whorl. Among the pieces of discarded leather were parts of a sheath, shoes, and a jerkin. A small crucible, pieces of slag, whetstones, and parts of at least thirteen rotary querns were found on the site; the querns had been quarried from local stone. 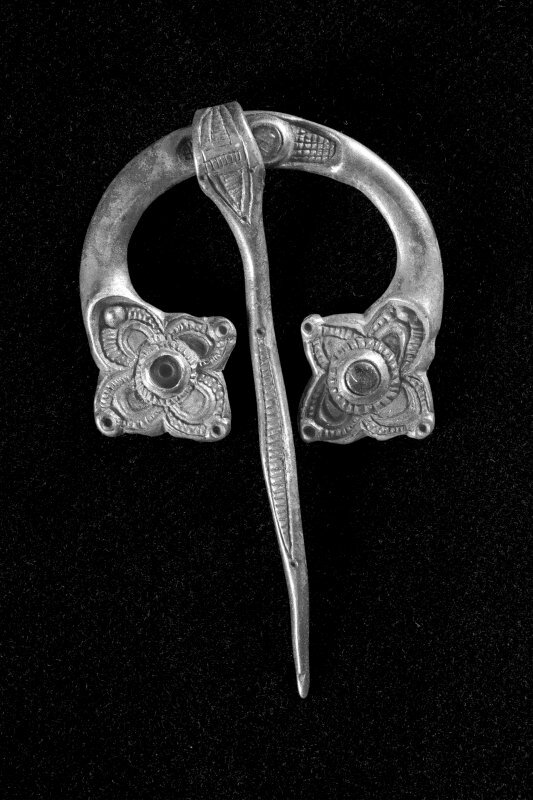 An iron 'bearded' axe, and a bronze peannular brooch were discovered. An almost complete vessel of E-ware was found on the surface of the crannog and parts of at least four others were found in the floor and in the brushwood forming the crannog platform. The pottery has been assigned to the period between the later 6th and 8th centuries AD, and the brooch, found about 0.6m deep in the layer of brushwood, may be dated to about AD 800. 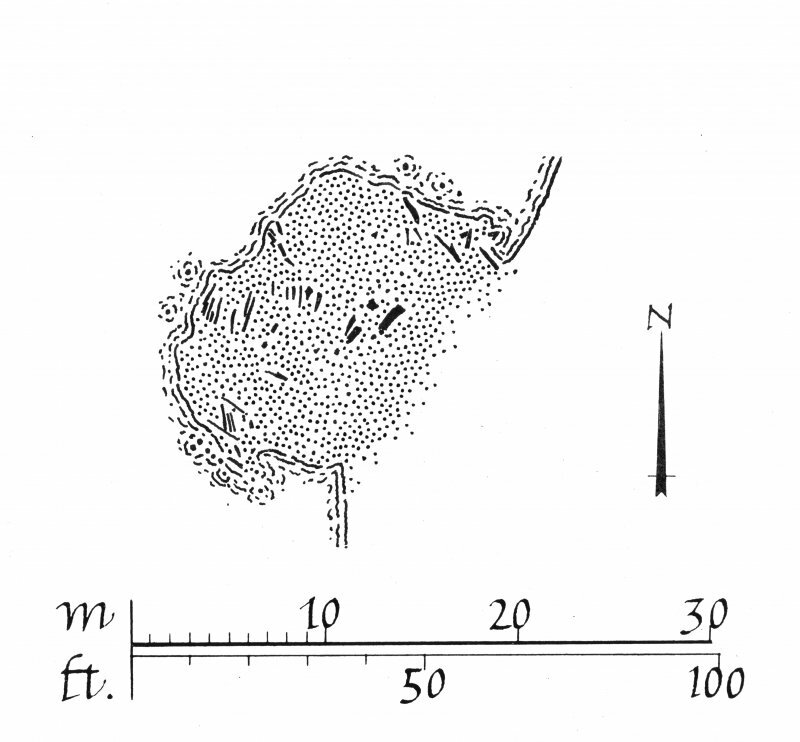 (The significance of the finds is discussed in the Introduction to volume 6 of the RCAHMS Inventory of Argyll (1988). RCAHMS 1988, visited May 1986. Turned bowl of Early Historic type 2 (A6046al/149). Carved rectangular troughs with rim handles (55, 120). Carved elliptical dishes (82, 83). Fragments of carved two-piece tub (15). Gaming pieces (?) (A6046bj/123 and A6046ap/151). Handles (23, A6046bh/29, A6046bj/54, A6046bb/92, 147, 157, A6046ag/186, A6046ac/189, A6046af/189, A6046bl/195). Carved pins (10, 42, 43, 48, 152, 196). Carved pegs (A6046bk/16, 107, 112, 187). Carved spatulae (A6046bc/44, A6046ba/56, A6046bb/57, A6046f/94, A6046 az/199, 131, 137, A6046y/148, 181). 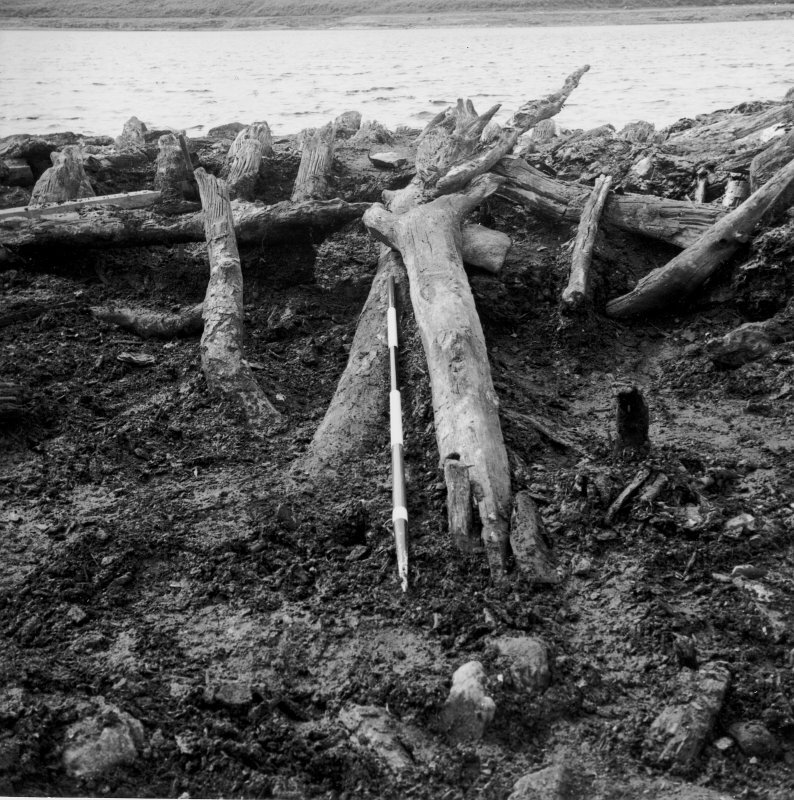 The unpublished excavation of 1960 upon the Loch Glashan crannog revealed that the upper substructure comprised oak and silver birch logs laid over a brushwood layer, in which there was found a wide range of artifacts, including sufficient timber objects to indicate both the wide variety of functions and techniques employed in domestic woodworking at this period, and the quantity of material that may be expected from the excavation of such monuments. A further parallel may be noted at Lochlea crannog (NS43SE 5). The heavily-waterlogged and uneroded nature of this layer accounts for the survival of much organic material, including both wood and leather. 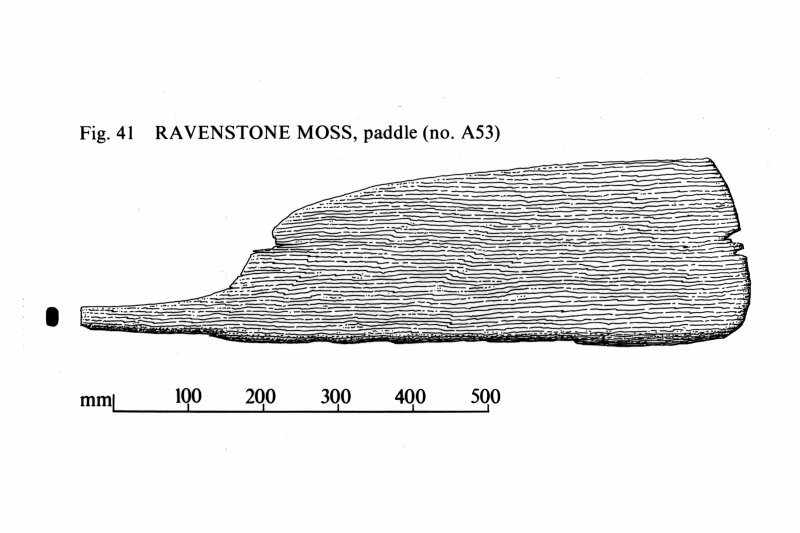 Following recognition of the multi-period nature of crannogs and the elucidation of the stratigraphic series at Buston (NS44SW 2), Earwood must be considered correct in proposing that the layer does not represent the foundation or substructure, but was formed by periodically raising the height of the crannog above one or more occupation-surfaces. 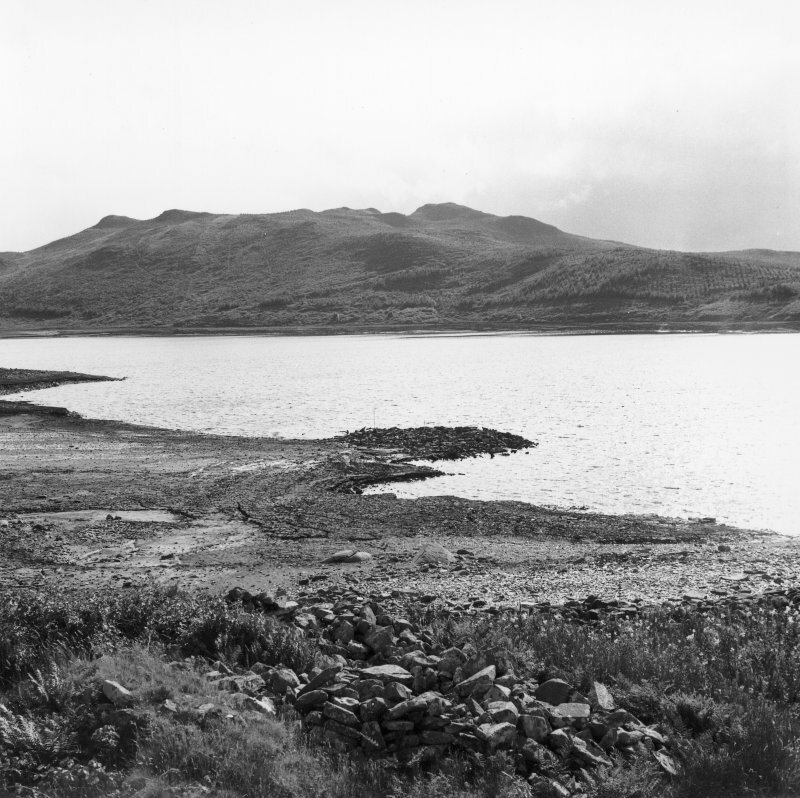 The excavations at Loch Glashan did not penetrate below the (then) water level. The occupation of the crannog has been attributed in general terms to between the 6th and 8th centuries AD, on the basis of the pottery recovered. 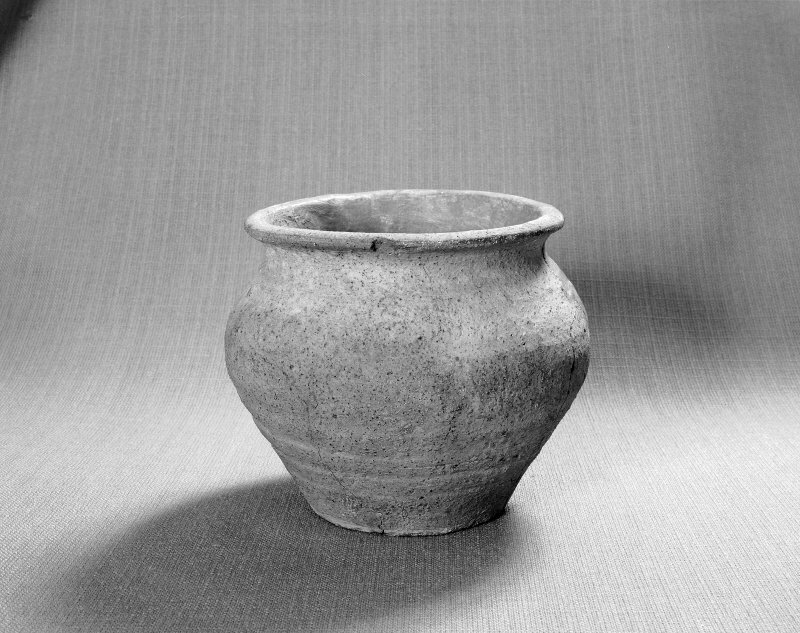 Earwood notes that the form of one (fragmentary) turned wooden vessel closely parallels that of E-ware pottery. 1. (Mowat A37) This 'Oar-shaped implement' was found with the blade end about 1' (0.3m) deep in the brushwood layer and the other end just projecting above the surface of that layer. It was found in a slanting attitude and upper end was 'weathered'. It was allocated small find no. 40 upon discovery and is in store under accession number GAGM A6046bn. The object is of rectangular section with rounded corners, and has suffered slightly from splitting. It measures 0.25m in length over all, and 30mm in thickness, and varies in breadth between 98mm at the broadest point and only 40mm at the narrow end, where it is broken. The widened and flattened broader end has been pierced by a now-incomplete hole which has probably been oval, having axial measurements of about 45mm and 60mm. Although this fragment bears a superficial resemblance to the transitional section of an oar or paddle between the blade and the shaft, it has more probably formed part of a structural member; the well-formed hole would have formed one element of a joint. 2. (Mowat A38) This object was apparently found complete at a depth of 1' or 2' (25mm or 51mm) in the brushwood layer. It was allocated small finds number 8 and identified as a wooden paddle, which identification appears correct. It is in store under accession number GAGM A6046bl. The wood has been rendered dark black during conservation treatment (probably with Carbowax) and numerous breaks have been repaired and infilled, but the object remains highly fragile, so that only the dorsal surface could be examined at the date of visit. The object measures 1.1m in length by up to 0.1m transversely, and is curved towards the ventral surface and to one side. The shape is only roughly-formed so that the junction of the blade with the handle is asymmetrically-rounded in form. 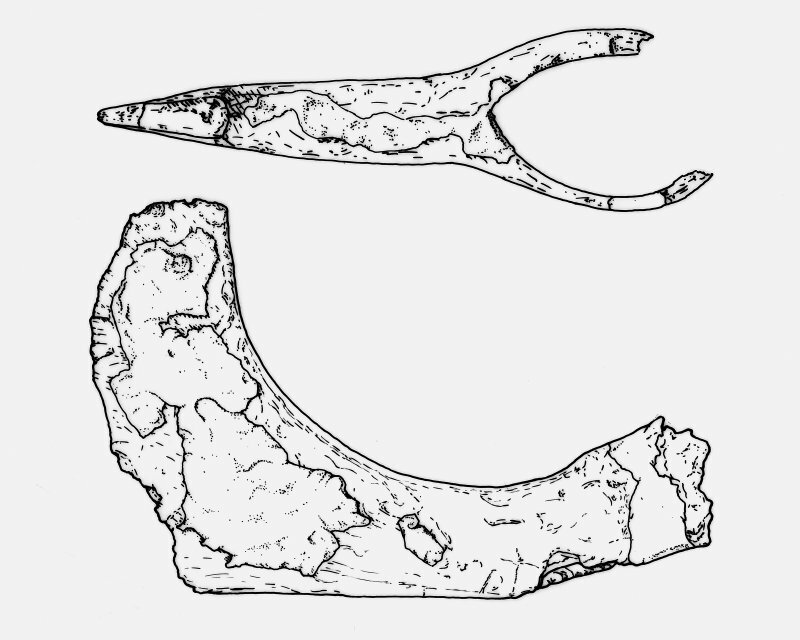 The handle itself is roughly circular in section and measures about 40mm in diameter along most of its length; it becomes more pointed towards the end, where it has been cut square across. The timber of the handle is heavily-knotted, and into it there are cut two holes of unknown origin and a depression which has possibly been worked with a tool. The blade is severely chipped around the sides and at the end, and has possibly lost some of its length. On the examined side there is a slight midrib, which measures about 15mm in thickness and tapers towards the edge. 3. (Mowat A39) This 'paddle-like object' was found 'set almost upright' in the brushwood layer; it was 'broken, with central hole'. Following numbering as small find no. 28, it was conserved and placed in store under accession number GAGM A6046bm. Two fragments of conserved timber that are held under that number fit together at the break and have probably formed part of a paddle of relatively sturdy construction. Neither of them is pierced, which may suggest that the object is incompletely preserved. One piece has a roughly rectangular section measuring about 50mm by 45mm, is about 0.26m long and apparently formed the lower part of the shaft of the handle. This piece has broken away at the point where it broadens into what was apparently a spade-type grip at the proximal end. The fragment measures 26.5mm in length and comprises the tapered junction of the shaft with the handle. The blade has apparently measured 90mm in breadth by 25mm in thickness and been roughly rectangular with rounded corners, a flat (presumably ventral) surface and a slightly convex (presumably dorsal) side. 4. (Mowat A40) The 'paddle-blade' or 'bat' that was found at a depth of about 2' (0.6m) in the brushwood layer was numbered as small find 119 and is stored under accession number GAGM A6046az. It has suffered slightly from splitting, and has been mounted (after conservation) on a board so that only one surface is available for inspection. Although this object cannot be specifically identified, it appears totally unsuitable for boat propulsion, and most probably had a domestic function, possibly as a platter or skillet. 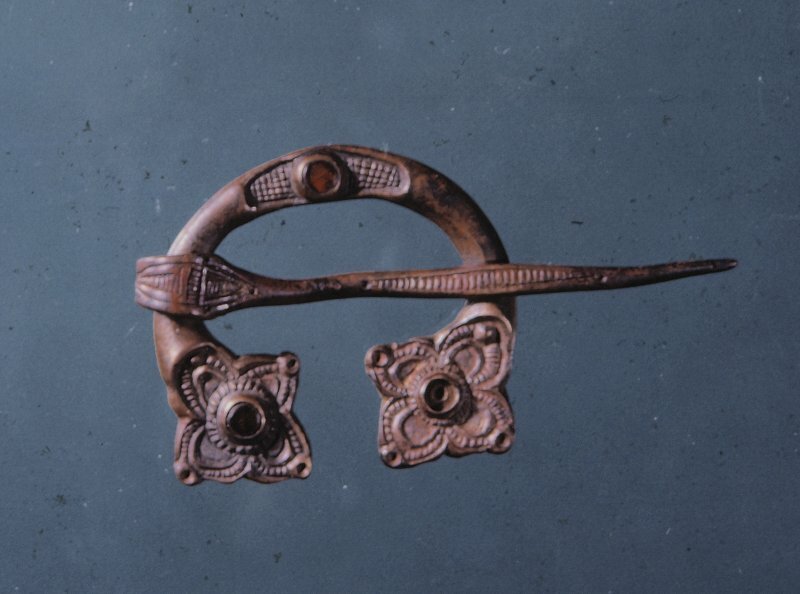 Earwood considers a variety of ethnographic parallels for this object and suggests a tentative identification as a flax beater, which would be consistent with one proposed function of (Mowat) A41 (below). The object is of flat form, and measures 0.43m in length over all by 15mm in thickness. The pear-shaped blade is 260mm long and is now some 160mm broad but has been worn asymmetrically and was probably originally some 50mm broader; part of one corner has been chipped away. The handle is clearly differentiated and measures 105mm in length by 30mm in width; at the proximal end there is an enlarged circular section which measures 55mm in diameter and is pierced by a central hole of diameter 11m. All the junctions between surfaces are rounded, except the edges of the central hole which are more sharply defined; the blade was apparently split in antiquity. 5. (Mowat A41) Listed as excavation finds number 57, there is an object of indeterminate function which has the form of a miniature paddle. It was found at a depth of 1'9' (0.5m) in the brushwood layer, and is in store under accession number GAGM A6046bb. It had broken into three pieces, which were re-united during conservation with Carbowax, but the object remains fragile and could not be handled at the date of visit. It has been worked from close-grained wood and measures 8 3/16" (208mm) in length over all. The blade is of an elongated-tongue shape with a rounded end, and measures up to 60mm in width by about 3/16" (4.8mm) in thickness; it is almost flat on one side, has a slight 'keel' on the other, and passes gradually into the handle, which is oval in section with a distinct thickened terminal. The finds list classifies it as a weaver's (or sword) beater, but it more probably had a domestic function or was, just possibly, a toy or model paddle, possibly with a similar ceremonial or ritual function to that of the numerous model religious objects found in Romano-British contexts. 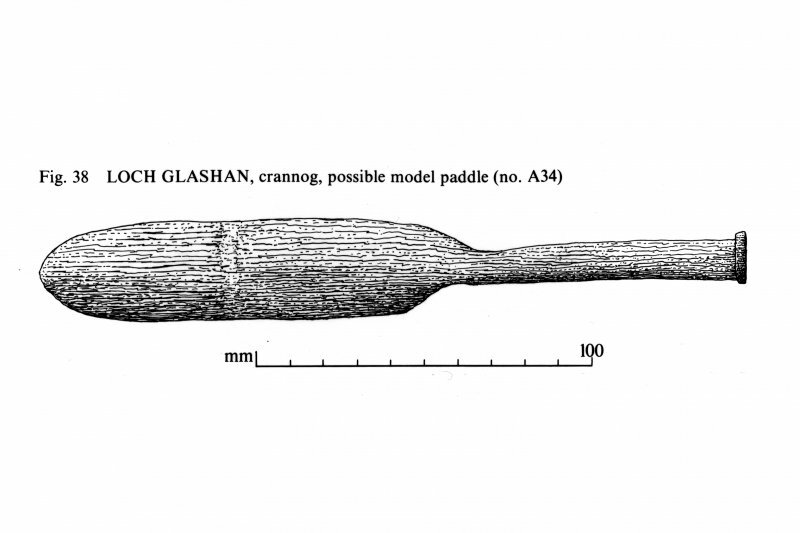 Earwood identifies it as a probable spatula (considering it too short for a weaver's beater) and catalogues several other objects of similar type from Loch Glashan besides citing parallels from the excavated Irish crannogs of Ballinderry 2 and Lagore. Wild confirms that the small size and apparent light weight of this object would render it of no use except in the weaving of tapestry, a craft not normally associated with crannogs. The discovery of several spatula-blades is also recorded; these were probably for culinary use. 6. 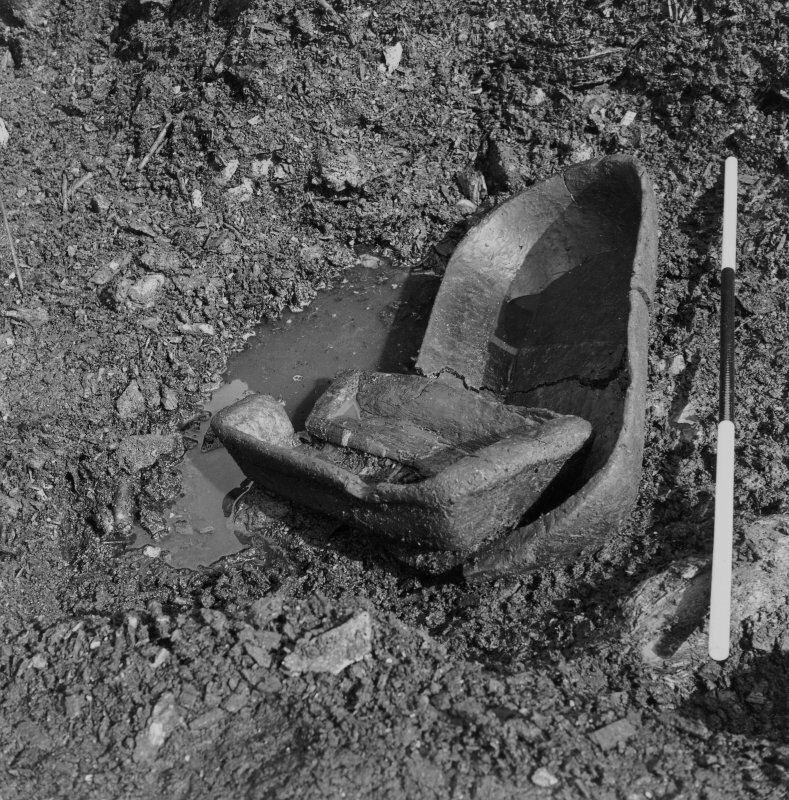 (Mowat A42) The object (GAGM A6046bq) that is numbered 55 in the finds list was classified at the time of discovery as a 'wooden bowl', but may, however, be better considered as a trough of the same general form as those from Cnoc Leathann, Durness (NC36SE 14) and Eadarloch, Loch Treig (NN37NW 3) with square ends and ledge handles. 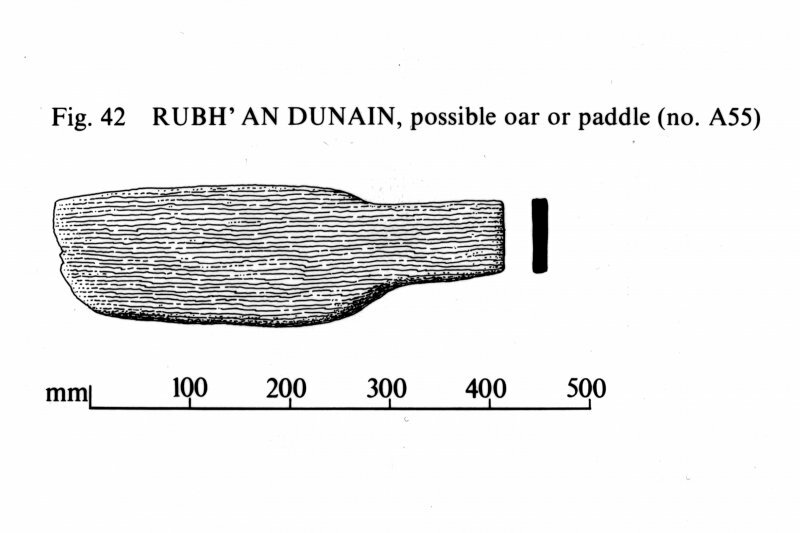 It is the largest wooden vessel from the crannog, and Earwood cites an additional close parallel in an Irish Early Christian context at Deer Park Farm, Co. Antrim. It was found 'almost upside down' and one side had been crushed by a large squared timber, while evidence of worm attack is visible in places. It has acquired a reddish-brown colour during treatment, but remains fragile so that the bottom could not be examined at the date of visit. The trough) has apparently been worked from a whole log measuring about 0.3m in breadth, and subsequently rubbed or sanded down to remove any toolmarks. It measures 0.94m in length over all by up to 0.28m transversely and 135mm in external depth, and has probably been rectangular in form, but one side has become bowed outwards from the pressure of overlying deposits whilst waterlogged. It is probable that the vessel formerly measured about 0.21m in breadth. The sides measure about 90mm in thickness and the ends slope inwards both internally and externally, while the full-length ledge handles measure about 100mm in length along the long axis of the trough and were probably originally of playing-card form, but have become chipped and rendered irregular by post-depositional abrasion. Externally, the sides meet the bottom in a succession of slight steps. The internal cavity has measured about 0.78m and 0.65m in length at the top and bottom respectively by 0.21m in breadth and 0.12m in depth, which equates to a capacity of about 18 litres. 7. (Mowat A43) The trough numbered 120 in the finds list is of broadly similar form to the larger vessel (Mowat A42) across which it was found lying at a depth of 1'10" (0.6m) in the brushwood layer. The central section of the base and most of one end have been lost through splitting (apparently in antiquity); further (subsequent) splitting and wear are also evident. Following conservation, it has been placed in store under accession number GAGM A6046bo. This ledge-ended trough or squared bowl (fig. 45) is described in the finds list as small and 'square-ended'. Externally, it measures 0.43m in length over all by 0.23m transversely and 90mm in depth; the corresponding internal measurements are 0.34m, 0.2m and 65mm respectively, and the flat bottom measures 285mm by 150mm. The capacity is about 4.4 litres. 8. (Mowat A44). In store under accession number GAGM A6046bp and classified as a trough, there is the object that is numbered 121 in the finds list and is there considered as a domestic bowl or dish, being captioned as such in the illustrations to the present work (pl. 22, upper and fig. 46) but is more probably to be classified as a small trough. It measures 0.7m in length over its rounded ends and projecting handles by up to 0.29m transversely and 125mm in depth. The flat bottom measures up to 0.5m by 150mm internally, and the capacity is about 12 litres. The tree-ring pattern is obscured but the grain runs from end to end and there is some evidence of splitting. The body of the bowl is rounded in section but flat-bottomed, and may loosely be described as pear-shaped. The larger of the two handles is located roughly one-quarter the distance down the side at the higher of the two ends, and within the interior there are the faint marks of a chisel, gouge or similar instrument. RCAHMS 1988; C Earwood 1991; C Earwood 1993; R J C Mowat 1996, visited October 1987, February 1989 and August 1989; MS. notes in GAGM: excavation finds list; information from Dr JP Wild. 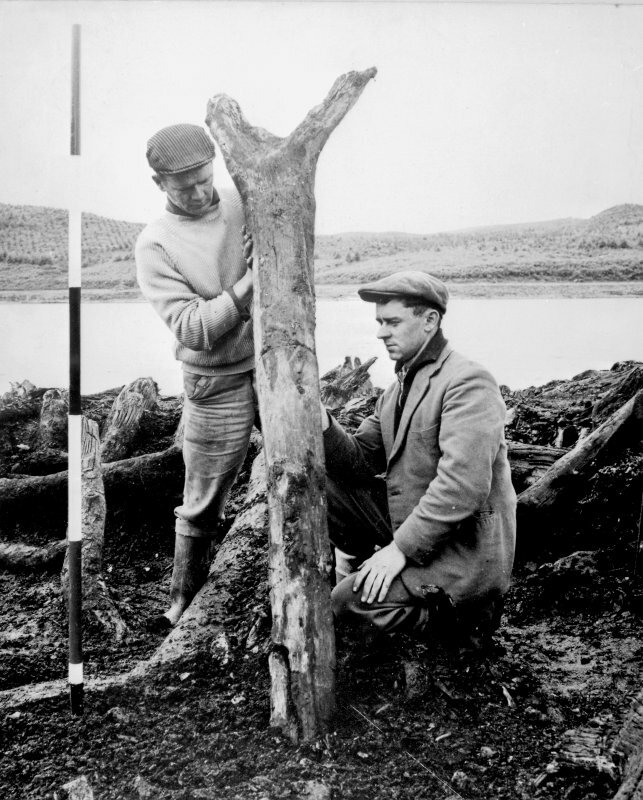 NR 9160 9247 A high-resolution side-scan survey of the reservoir at Loch Glashan, also known as Loch Gair, was carried out in an effort to locate and sample the crannog excavated by Mr J G Scott in 1960. 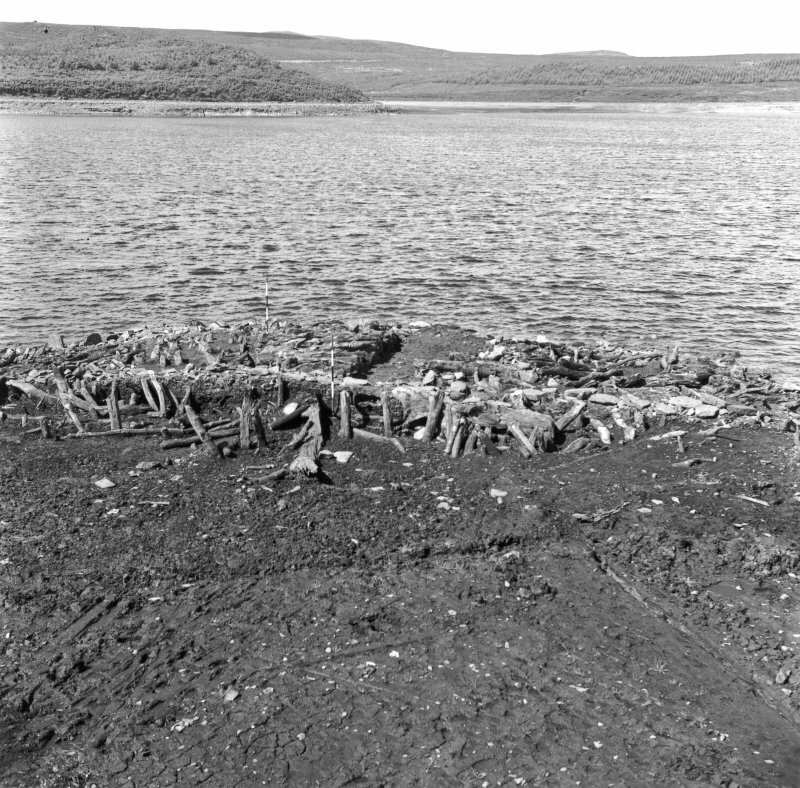 The site of the crannog was located in 16m of water, but was found to lie underneath at least 2m of very soft reservoir silt, making sampling and the controlled recovery of timbers impossible without excavation. The nearby submerged medieval island settlement (NR99SW 4), thought to be the site of an Early Christian church, was also located from a depth of 10.4m. Some walling could be traced but heavy silting began at 10m, obscuring the majority of the structure and the margins of the island itself. As the side-scan can penetrate soft silt deposits, images of the crannog and the nearby medieval island settlement were obtained.